School Library Journal School Library Journal | Record Breakers! 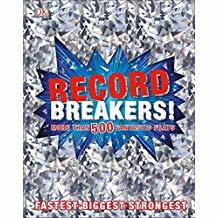 School Library Journal | Record Breakers! Record Breakers! 192p. index. photos. DK. Sept. 2018. Tr $19.99. ISBN 9781465474384. Gr 3–7—Fantastic feats of the natural, sporting, and engineering worlds are celebrated in this large-format reference book. Readers may not need to know the heaviest insect or the animal that has the most babies in its lifetime (the rabbit, of course), but why not? Students will relish learning about these fun facts, many of them eye-opening, jaw-dropping, and sure to inspire discussion. Double-page spreads are laden with DK's signature bold images, sidebars, and attention-getting design. Here are the records about ordinary and extraordinary people, of animals great and small, of athletes, astronauts, and accomplishments of engineering awe. Records are put into perspective (big vs. small, heavy vs. light, etc. ), enticing readers to learn more about the subjects that draw them in. VERDICT This is the kind of book that easily attracts readers—a browsing title that will get a lot of circulation at both public and school libraries.